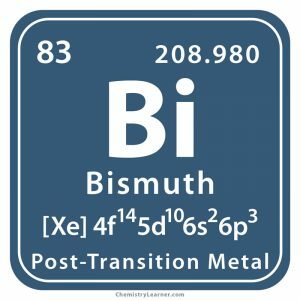 Bismuth (pronounced as BIZ-meth) is a brittle metal, existing in several allotrope forms, and denoted by the chemical symbol Bi. 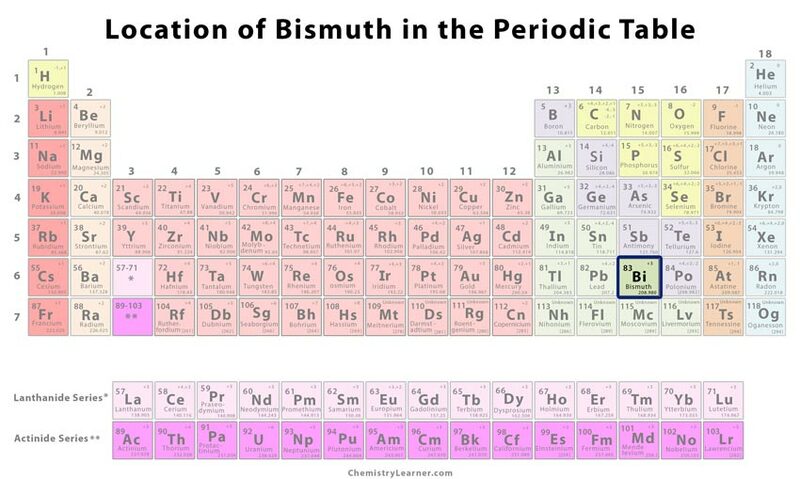 It belongs to the nitrogen family having 33 isotopes with mass numbers ranging from 185 to 217 of which only Bi-209 is natural and stable one with a half-life of 1.9×109 years . 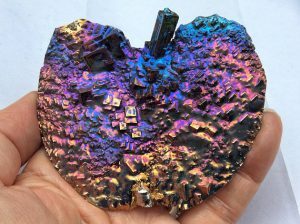 A rare metal, it occurs in ores like bismite and bismuthinite as well as associated with copper, lead, silver, wolfram, gold, and silver present in several bare mineral deposits of Peru, Mexico, Japan, Canada, United Sates, and Bolivia [1, 4]. Origin of its Name: its name is derived from the German word ‘Bisemutum’ which means white mass. 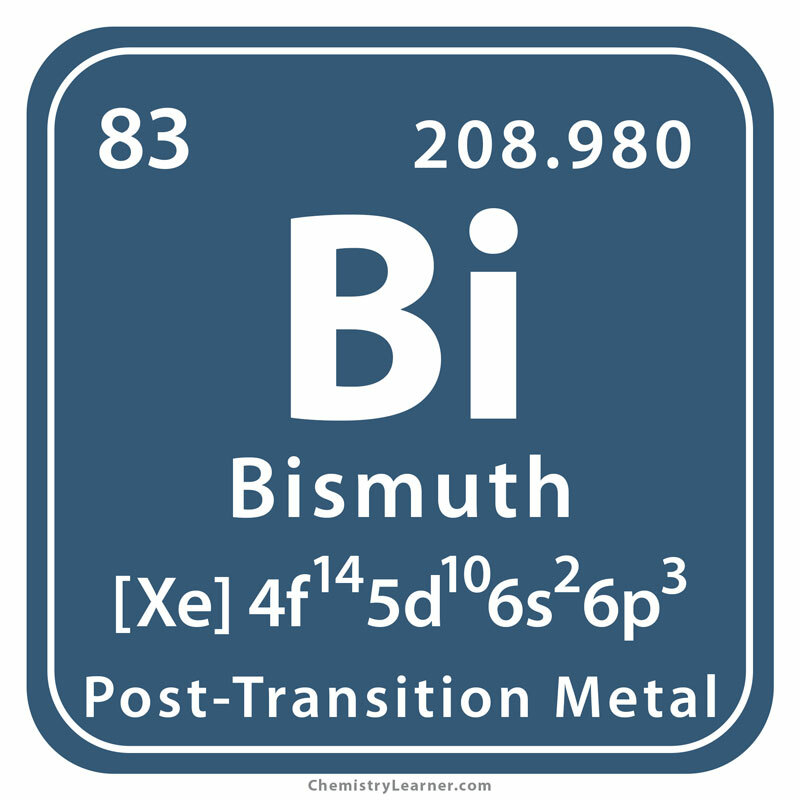 Around 1400 AD, the element was discovered by an alchemist whose name is not known. 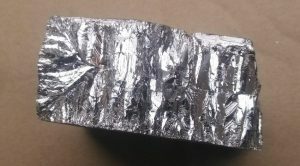 Although in the next century it was used as an alloying agent for cast types of printers and caskets, in early 1500’s Georgius Agricola, a German mineralogist, recognized it to be a metal having distinct properties. In the early 1700’s, a German professor called Caspar Neuman made the same analysis. 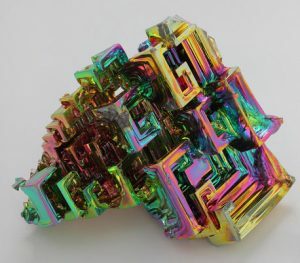 Finally, in 1753, the French chemist Claude-François Geoffroy furnished further proof stating the existence of a new metal called bismuth . 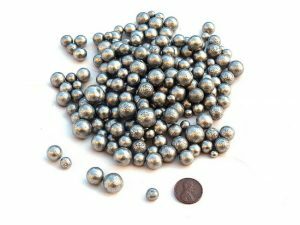 Shotgun shells made of the element are used in reloading hunting revolvers and rifles since it’s less expensive than lead and tungsten ammunitions with the same characteristics . It is used in making magnetic levitation devices . An insoluble salt of trivalent bismuth and salicylic acid, bismuth subsalicylate, is used as medicated chewable tablets in the treatment of upset stomach, heartburn, and nausea [8, 9]. Bismuth bronze, an alloy of copper, zinc, nickel, lead, and Bi is used in casting of mirrors, reflectors, and lamps . 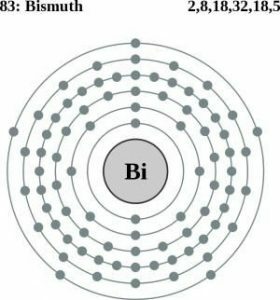 Since Bi has a high electrical resistance, the nanoparticles of its oxide are used as cathode in solid fuel cells, and cancer imaging . 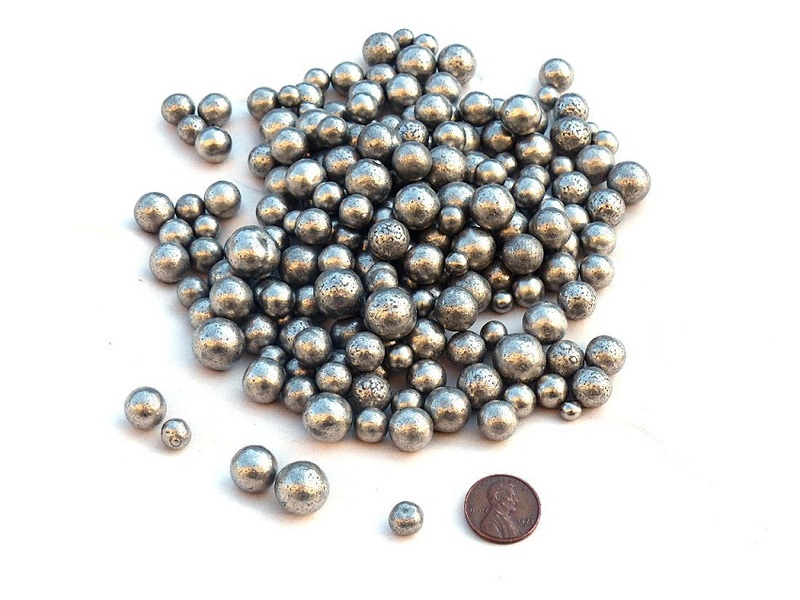 It is a good substitute for lead in the manufacturing of water pipes, sinkers, solders paste and fishing weights . 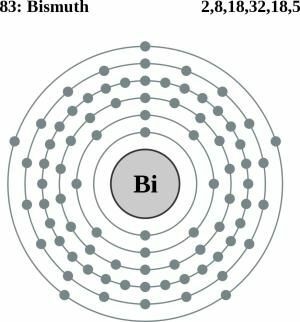 Bi-based glasses have been replaced with lead-containing ones due to their less toxicity . Baths electroplated with the metal is important in the manufacturing of bearings for gasoline and diesel engines . 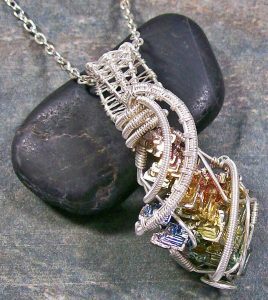 The crystals of Bi are applicable in making jewelry like rings and necklaces. The image used in representing the metal is an alchemical symbol with ancient chemistry apparatus in the background . Bismuth can be grown artificially into large crystals. 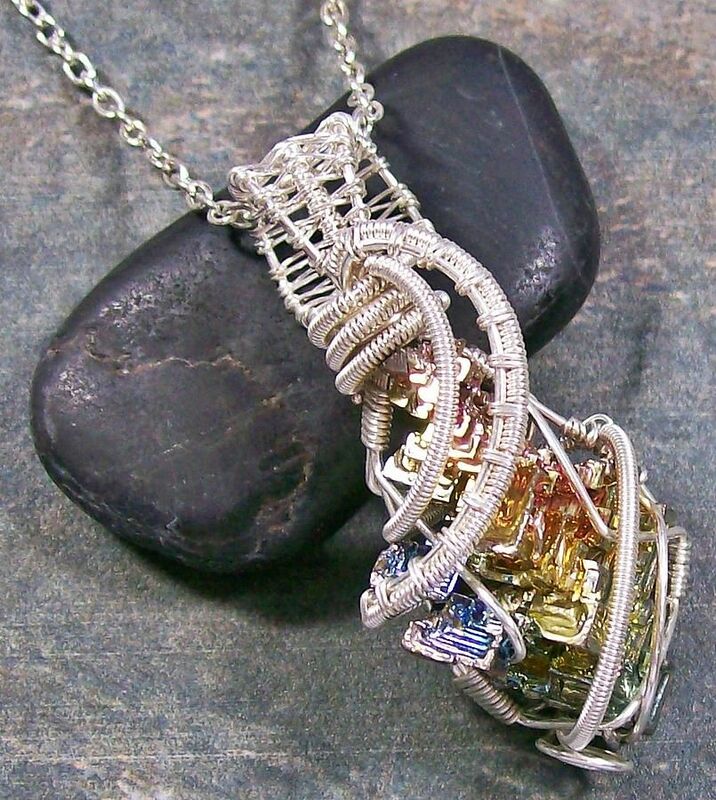 The cost of the pure/raw metal varies between $39 and $40 per 100 grams.